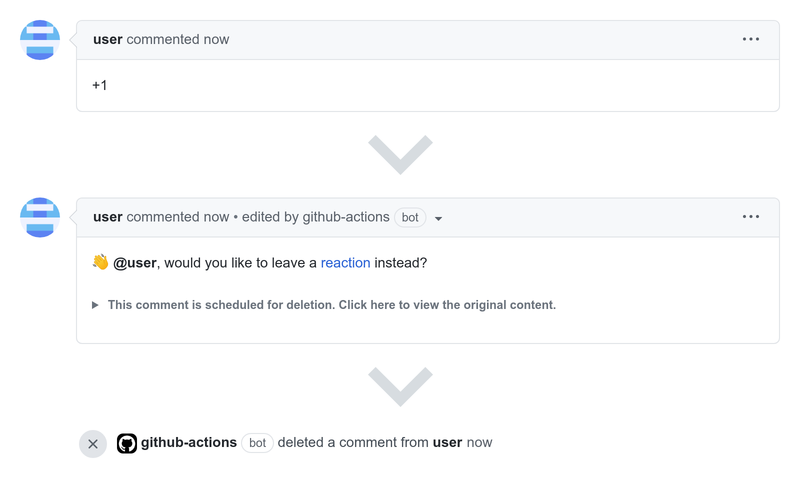 A GitHub App that deletes +1 comments, and encourages the use of GitHub reactions. The app detects if a new comment consists solely of emojis and shortcodes used in GitHub reactions. A matching comment is either replaced with the message set in reactionComment and deleted after a day, or it is deleted immediately, if reactionComment is set to false. ⚠️ If possible, install the app only for select repositories. Do not leave the All repositories option selected, unless you intend to use the app for all current and future repositories. # Issues and pull requests with these labels accept reaction comments. The continued development of Reaction Comments is made possible thanks to the support of awesome backers. If you'd like to join them, please consider contributing with Patreon, PayPal or Bitcoin. Reaction is provided by a third-party and is governed by separate terms, privacy, and support documentation.